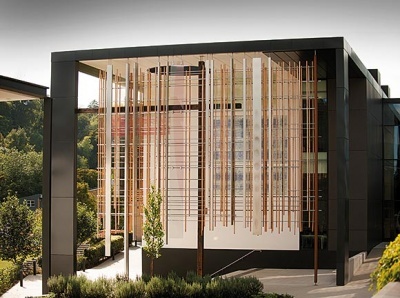 The centrepiece of a new steel framed university teaching block is a hanging artwork of Christian symbols. 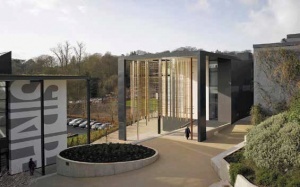 The latest instalment in the University of Winchester’s redevelopment masterplan is the recently completed St. Alphege Learning and Teaching Building, a project that has made full use of steel construction’s speed and flexibility. Providing teaching spaces for 600 students, the new two-storey building has achieved a BREEAM ‘Excellent’ rating and is part of the University’s aspiration to drive for higher standards for studying and learning. The building has been constructed with a primary steel braced frame supporting block work walls, while an insulated rain screen cladding is fixed to the structure to form the finished envelope. One end of the building is completed with a 12m high portico housing a highly distinctive artwork of Christian symbols. Flexibility was another important design consideration that a steel frame was able to satisfy. None of the structure’s internal walls are load bearing, meaning they could be removed in the future if the teaching spaces needed to be reconfigured. Steel beams support exposed 12m span precast planks for all floors and the roof. The floors are water cooled as part of the overall heating and cooling strategy for the building. Pipework is linked directly to an air source heat pump and the building’s management system. “A steel frame and precast planks were used to achieve optimum thermal mass as the teaching rooms are fully occupied throughout the day resulting in significant heat build up from both students and computers,” says Mr Jobson. 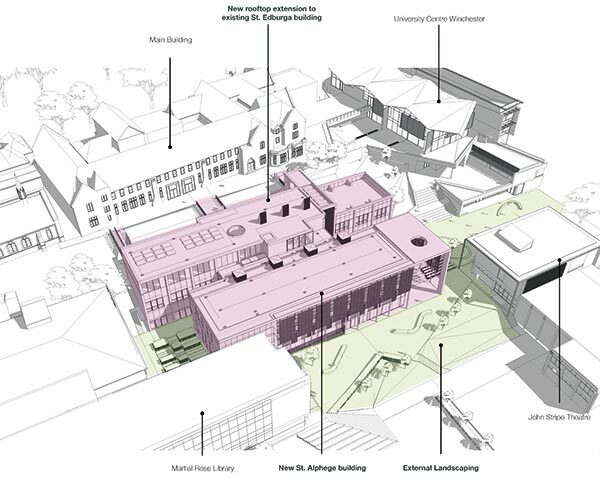 The St. Alphege Learning and Teaching Building is positioned on a steeply sloping site close to the campus entrance, a spot previously occupied by a 1930s Faculty of Arts building that was demolished to make way for the new building. 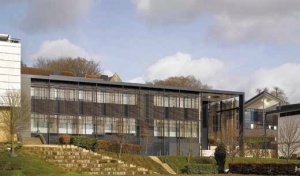 The new building is connected to the existing 1970s St. Edburga teaching block, which has undergone extensive refurbishment works as part of a second phase of the contract (see below). Constructing a new two-storey block adjacent to an existing building posed a few challenges for the team, not least because St. Edburga had to remain partially operational during construction. Consequently, keeping noise to a minimum as well as inter-trade co-ordination were key issues. Another key factor concerning the St. Edburga building is that it has floor-to-ceiling heights of just 2.3m. The team wanted to have level floor plates to ease the transition between the two buildings and provide a degree of symmetry. This was however problematic because of the desire to have higher teaching spaces in the new accommodation. Design Engine therefore opted to make the ground floor of the new teaching block double height so that the first floor could align with the new upper storey of St. Edburga. Acknowledging the University’s Christian links, the work represents Christ surrounded by the apostles, symbolised by suspended steel box sections, while a weathering steel element represents Judas. Thirty stainless steel rods, denoting the pieces of silver that Judas received for betraying Jesus, link all of the hanging elements. The project’s artwork highlight is accommodated within the galvanized steel portico, formed by two 850mm wide × 200mm thick steel ladders and supported off of one end of the main steel frame. The portico provides a frame for hanging artwork, designed by the architects in consultation with the University. The second phase of the contract consisted of the complete refurbishment of the St. Edburga building with a new thermally efficient external cladding and a brand new rooftop teaching extension. The St. Edburga building is connected to the Learning and Teaching Building via a new steel framed glazed atrium. Together the two buildings combine to form a new landscaped piazza space fronting the campus entrance.